The Epson ColorWorks C7500 Matte (TM-C7500) label printer is a high-speed, full color label printer capable of printing the most durable GHS BS5609 labels available. Built for speed, durability, and performance, the Epson TM-C7500 Matte label printer has much lower printing costs than laser and thermal transfer printers. 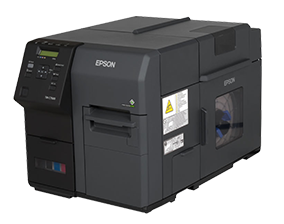 Our leasing program is an affordable way to finance the Epson TM-C7500 Matte GHS BS5609 label printer. Designed for printing on matte label and tag stock, the Epson TM-C7500 Matte accepts label media from 2 to 4.35 inches wide. Add the optional TM-C7500 Rewinder to print roll to roll for just $749. Need to print full color product labels? A gloss version, TM-C7500G, is also available. View the similarities and differences here. DuraFast Label Company is your one-stop source for Epson TM-C7500 Matte ink and supplies. The Epson TM-C7500 matte printer is designed to print industrail labels for durability on matte finished label materials for applications like GHS BS5609. 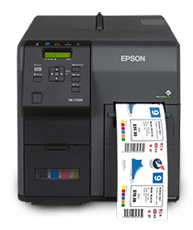 If you need to print glossy labels for your retail products, then use the Epson TM-C7500G Gloss label printer which has special inks for printing on high gloss shiny surface with materials like glossy polypropylene and clear polyesters. Also you can have look into our versatile and cutting-edge UV/Aqueous Coating System that provides on-demand digital printing with a quick and effective solution to apply a clear protective coating to printed, roll to roll or cut sheet labels and up to 10” wide by nearly any length.